Want to play around with Google’s AI projects? Well, now you can thanks to a website which makes the company’s tinkering with artificial intelligence available for the public to sample. 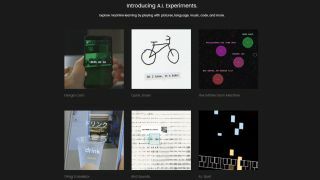 If you head over to the AI Experiments web page, you’ll find eight different experiments on offer, designed to illustrate what machine learning can do and appeal to a wider audience (with the option to submit your own work, to boot, if you’ve concocted anything along these lines yourself). The web-based apps include one which is an experiment in seeing whether a neural network can recognise a sketch. With Quick Draw, you simply doodle something on your touchscreen and the AI gives its best guess as to what that object is. Then there’s Giorgio Cam, which analyses a photo you’ve taken, and recognises objects in that image – nothing new there, but the innovative bit is that it then makes up some song lyrics about said objects. There’s also a drum machine which has used machine learning to group similar sounds together across a huge landscape of noises, allowing you to create some novel compositions. And a ‘thing translator’ which allows the user to take a picture of an object, and then tells them how to say the word for that object in a foreign language (this one is a combination of Google’s Cloud Vision and Translate API).